Now that you have decided who you want to marry the next question is probably where! 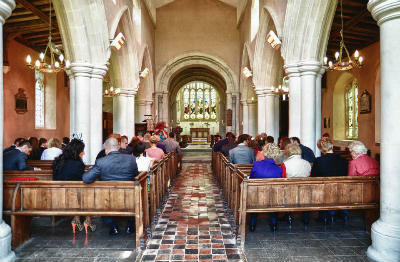 If either of you live in the parish you are entitled to be married in the parish church. And here we extend that right across the whole benefice. So you can marry in any of the five churches. You can also marry in one of our churches if your parents lived (or worshipped) in the parish for 6 months during your ifetime. Also if your Parents or Grandparents were married in the Parish Church. Lastly, you can make a new quallifying connection by worshiping regularly in your chosen church for at least 6 months. Please contact the Rector to find out what 'regularly' means. You may be asked to prove this connection. You'll also need to be 18 or older, and you 'll need to demonstrate your British or EU citizenship. Banns still have to be read in both the Church where your wedding is to take place and in the parishes where you both live. If you are British and have a connection but live abroad, we can arrange a common licence to marry. If either of you is not a British or EU Citizen there may be other ways to get you a licence to marry by special license. This may sound complicated but these are new rules which will allow more people to begin their marriage in church with the blessing of God and the prayers of the community. ¨ What if one of us is divorced? 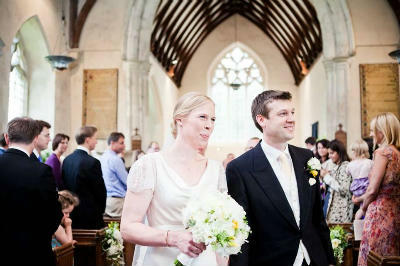 It is possible to be married in church if you have been divorced, but you will need to speak to the vicar for more information. ¨ How long will the service be? 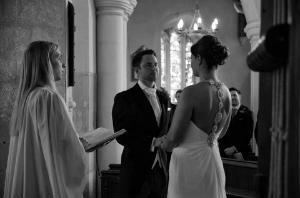 Most weddings have 2 or 3 hymns - for help in choosing them please speak to a priest or one of our organists. ¨ What readings can I have? It is requested that you have one Bible reading, but many couples also include poetry and other readings. ¨ Can we take photos/videos? PHOTOGRAPHY: Yes - but please no flash photos during the ceremony. Most couples and vicars find it very distracting. VIDEO: Yes, provided your videographer can provide a copy of their apropriate copyright and performance rights licence. Music and words used at a service are almost certainly copyright. An additional fee may be sought. Photographers and Videographers are expected to be discreet as the move around the church and must be smartly dressed.It is a wedding after all! We encourage couples to set a clear brief for the photographer and consider the time and delay photography can sometimes cause. ¨ Can we use confetti? Yes - but not inside the church and only the paper biodegradable sort. Dried rose and flower petals are by far the most suitable, and they can be obtained for free!. Foil, silk and rice are not acceptable. ¨ Can we have Bells? Choir? Organist? Music? Yes - Please speak to us to book and there is a cost implication, see below. ¨ How much will it cost? The fees for a wedding are about £700. This breaks down into statutory fees set by the Government and the Church of England centrally and local additional costs. Your wedding fee will vary slightly depending on whether or not you need Banns or other types of licence and what extras you choose. The fees for the current year are set out in each church on the notice board. The fees usually increase by the rate of inflation each year. The local church also asks for additional donations to cover heating and other running costs. If you wish to make additional donations for the work and upkeep of the church it would be most welcome. Other costs for professional services arranged through the church may include: Organist - £110 and verger £20. Bells are arranged separately and will cost £120 for the ringers and £20 for the bell rope fund. We do not have a choir. You are welcome to engage professional singers and musicians at your own expense. We have very limited facilities to play recorded music, though it can be arranged and we do have a licence to do so. However, we do not allow recorded music for accompanying hymns. We can provide the names of the flower arrangers at each of the churches - or you can use your own florist. ¨ Will we have a rehearsal? Yes - all couples need to have a rehearsal, usually on the Thursday or Friday before their wedding day. This is very important as you will practice your vows and it will help you be more relaxed on the day itself. It is also a chance for reflection and prayer in the place where you will marry without the pressures of the wedding day itself. ¨ What if i'm late? Don't be late. We strongly urge the groom and guests to arrive 20-30 minutes before the start of the wedding. While brides are sometimes delayed for all sorts of legitimate reasons, we urge couples to plan carefully to ensure the bride arrives on time. The wedding is booked for a precise time. While we will do our best to accommodate a delay, there is a risk that the vicar and other professionals may be booked for other weddings and cannot wait. ¨ Is marriage hard work? Many couples are excited about their wedding day, but remember it is only one day whereas a marriage lasts a lifetime. We try to offer support to all our wedding couples, not just for the wedding but for the marriage itself. Every couple will be invited to meet with me a few times in the run up to the wedding when we talk in more depth about marriage and the basis for a good relationship, you will also be given information on places which offer help and sources of support if things do become difficult. ¨ We are not regular church goers...? You will always be welcome, and you may find that this is a time in your life when you start to think more deeply about God and your relationship with him. To discuss this further do be in touch. ¨ We already have children…? You have been blessed with the gift of Children and now the gift of marriage - time to give thanks to God! Marriage will change your family, and we pray give deeper commitment and joy to you all. Lord God, we thank you for the gift of love, and we thank you for each other. We pray for our wedding day, that it may be filled with joy and touched by your presence. And we pray for our marriage, that it may be life giving and life long, and that as we journey together you will be with us always, in the joys and the sorrows, through Jesus Christ our Lord. Amen.